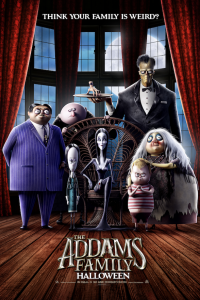 The first trailer for the new animated Addams Family movie has arrived and it looks fun – grimly amusing with good characterisation, if not rip-roaringly hilarious (from the 90 seconds we’ve seen so far anyway). And I did love the illustrations of the many different kinds of family at the start. The voice cast is top notch: Charlize Theron as Morticia, Oscar Isaac as Gomez, Chloe Grace Moretz as Wednesday and Finn Wolfhard (an Addams Family name if ever I heard one) as Pugsley. The animated comedy is released on 11 October in the US and 25 October in the UK. It’s directed by Greg Tiernan and Conrad Vernon.